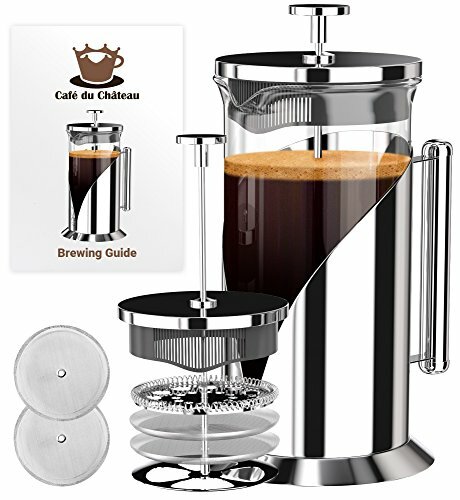 To ensure the purest possible flavor, Café du Chateau utilizes a superior filtering system consisting of two stainless steel screens, a spring-loaded base that seals the edges during pressing and a lid strainer to trap any grounds. There's no unpleasant muddiness you typically get with other french presses. Café du Chateau is designed in the European style with clean, modern lines. The base, lid, and handle are 304 food-grade stainless steel with a highly polished finish that imparts a brilliant shine and protects it from rust. The removable carafe is made from heavy, tempered borosilicate glass that withstands boiling water. Café du Chateau comes with a complete, detailed brewing guide on how to press the perfect cup. You'll savor the deep roasted flavor, full body and subtle notes of your favorite beans from your very first cup. Café du Chateau is guaranteed for life against breakage and damage. Should anything happen to the press, we'll send you out a replacement for FREE. -WHEN POURING HOT LIQUID, HOLD FRENCH PRESS BY THE HANDLE AND ENSURE LID IS ON. To guarantee carafe does not slip out of its stainless-steel compartment, use your other hand to gently press on lid when pouring. -Use caution while handling all parts of the French press, including the filters. There are sharp edges that need to be handled with care. The edges of the stainless-steel housing are very sharp! Inspect glass carafe for chips, cracks or sharp edges before use. 4 LEVEL FILTRATION SYSTEM - We use double stainless steel screen filters on a durable plunger supported by a spring loaded base plate to seal the edges, followed by a final top lid strainer to give you a pure brew with no grounds unlike other cheap presses. Perfect to make fresh French coffee, tea, espresso or even cold brew. ONLY THE FINEST QUALITY MATERIALS - Every single metal piece is 304 grade stainless steel giving the coffee press a resilient shine and protecting it from rust. The large carafe is made of thick borosilicate glass that can withstand boiling water! It is also portable and small enough to fit in a travel bag or backpack, making it easy to bring on camping, hiking or backpacking trips, outdoor activities, or to work or the office. LIFETIME REPLACEMENT GUARANTEE - If anything happens to your original Café Du Chateau french press coffee maker or accessories, no need to buy another. We will send you out a replacement for FREE. We take delivering ultimate customer satisfaction personal. We are here to serve you with our lifetime warranty! BPA FREE - All individual materials on the cafetiere surpass food/drink grade quality requirements with certified lab tests to back it up. BPA free plastic lid strainer, 304 food grade rated stainless steel, thermal resistant borosilicate glass pot (8-cup, 34oz). Also features a unique modern European design beaker housing that adds luxury to any kitchen. DETAILED INSTRUCTIONS TO MAKE THE PERFECT BREW - At Cafe Du Chateau, we go above and beyond to satisfy our customers which is why you get a detailed coffee brewing guide and brewer manual to accompany your coffee presser, giving you the best tasting coffee or tea in the palm of your hand. Also makes a good gift! If you have any questions about this product by Cafe Du Chateau, contact us by completing and submitting the form below. If you are looking for a specif part number, please include it with your message.